The Web Reporting Tool for Excel (GTD Excel Report Server) is a publishing solution for businesses to generate sophisticated Excel reports via the web or within enterprise applications from databases or structured data sources. Excel reports generated by the Web Reporting Tool can contain colors, font formats, charts, formulas and more. Scheduling allows to set up automatic report generation and have the reports be sent by email. Easy to integrate within applications. Download the server edition and run it as stand alone server. Download the WAR package and deploy it in a J2EE container. Flexible and powerful web reporting solution to make reports useful, clear and meaningful. Java based, the web reporting tool runs on every operating system that supports Java 5 or higher (e.g. Windows, Unix, Solaris, OSX 10.4+, AIX). The Remote Interface is a convenient way for administrators to configure the server when a direct access to the server is impossible. The server can be controlled via web browser, even to shutdown the server. Data for the reports can be connected from any JDBC data source such as MySQL, MS SQL Server, Oracle, PostgreSQL, SQLite, and more for which drivers are included. Change the database source configuration at run time or design time. Visual Report Template Designer allows predefined report layout and editing of individual cell formats by visual designer. Templates can also be modified with Excel. Rich Excel formatting allows the use of fonts, sizes, styles and colors in the same way as Excel. Independent from MS Excel run time, no Excel template is required. Dynamic reports can be customized with parameters via URL or by the user at run time. Report permissions manage the visibility rights of reports. Integrates with LDAP to login using the Active Directory and other LDAP servers. Scheduler allows to create reports with an execution time and send them via email. Multiple language reports an be generated (labels and formatting). Rapid development with several common predefined report layouts provided. No technical knowledge is required to customize reports. Complex Excel based reports and templates can also be developed. Produces different output formats (Excel, CSV and HTML). 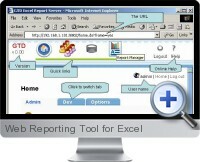 Possible to call the Web Reporting Tool for Excel from other programs and applications.